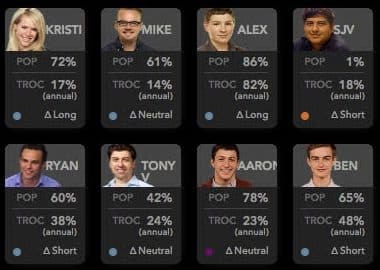 Robinhood is famous for its free stock trading platform while tastyworks has rapidly earned a reputation as a top options broker by charging no commissions on closing stock and options trades. Compared to the best brokers in the industry, Robinhood and tastyworks shine by including a social dimension to their platforms. Unlike their old-school competitors, the new crop of brokers recognize that traders enjoy connecting with each other, sharing ideas, and learning from successful investors. 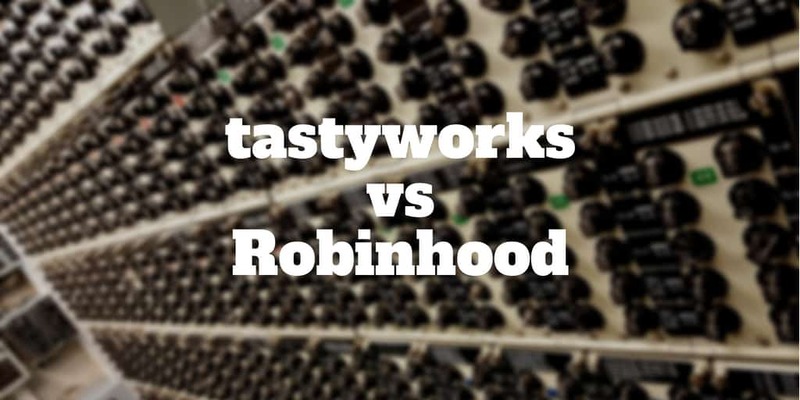 And while both brokers are similar in some areas, they target very different types of traders, so between Robinhood vs tastyworks, which is right for you? Does Robinhood Really Provide Free Stock Trading? Which Trading Platform Is Best: Robinhood or tastyworks? Robinhood shot to fame by lowering the cost of trading stocks to zero. But how can Robinhood stay in business by charging nothing when most other brokers charge a fee for each trade? What users may not know is that Robinhood sells customer order data to market makers. Market makers pay brokers to process transactions. On each transaction you make on the Robinhood app, the broker is paid. So, while you the customer does not pay a commission, make no mistake that Robinhood is pleased when you trade more frequently. As a free stock market trading broker, Robinhood lives up to its promise but it also features a premium service, called Robinhood Gold. If you want access to margin, you must pay. And lastly, cash sitting in your brokerage account earns money for Robinhood because it is loaned out, albeit at pretty low interest rates of interest these days. While fee-conscious stock traders will find Robinhood hard to beat, savvy options traders will find tastyworks to be virtually unparalleled. tastyworks was founded by traders for traders. 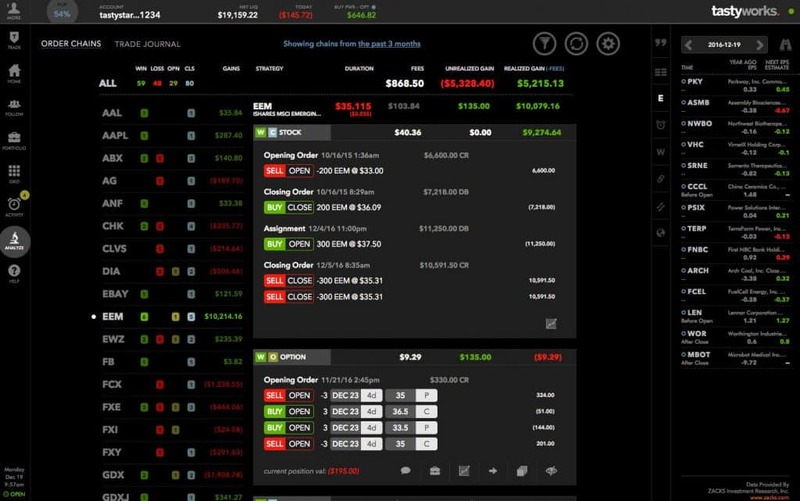 Whether you trade stocks, options, or futures, tastyworks can deliver a platform with lightning fast executions and rock bottom commissions costs. 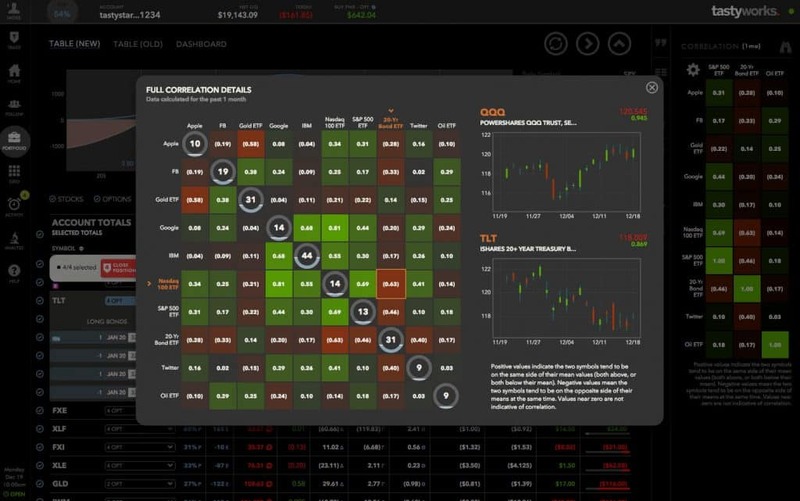 Beyond low pricing, tastyworks shines with numerous social trading features. If you ever wished you could follow other traders, wish no more! Simply click a featured trader’s profile to view a stream of their previously executed trades. 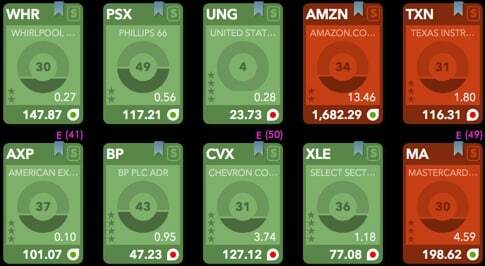 Another nice feature is the stock Grid, which provides a view of which stocks are trading higher and lower on the day. When you select a particular stock, an options chain pops up so you can easily place trades quickly. The tastyworks platform is designed for active stock, options, and futures traders while Robinhood is ideal for fee-conscious traders who want to pay no commissions on stock and cryptocurrency trades. Commissions and fees on the tastyworks platform are very reasonable compared to most other brokers. 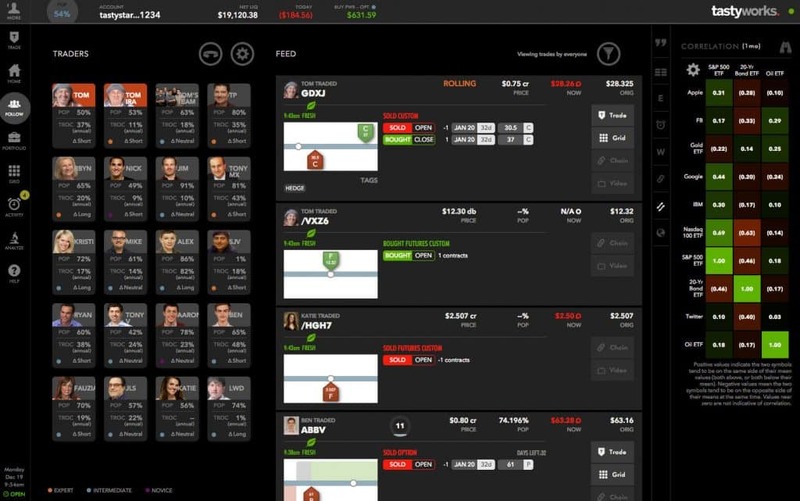 tastyworks is the better bet if you wish to place options trades or futures trades regularly. While Robinhood has no commissions on stock trades, it is by no means a specialist options trading platform. In fact, Robinhood doesn’t even support market orders for options trades due to their lower liquidity levels whereas this is no issue at tastyworks. If options and futures trading is not your thing, but trading stocks and cryptocurrencies is, then Robinhood is a better match. Margin trading is available at both tastyworks at Robinhood. tastyworks follows the more conventional approach of charging interest on margin funds, which essentially is money loaned to you. Robinhood also loans money on margin but charges a fixed monthly fee depending on how much margin you need. You will need to upgrade to Robinhood Gold to be approved for margin. Robinhood supports very few options trading strategies. Only the purchase of long calls and long puts, covered calls, and cash-covered puts is available. By comparison, it’s hard to imagine an options strategy not available at tastyworks. Whether basic options strategies like married puts, bear call spreads, and bull put spreads, or more complex ones like iron butterflies and ratio backspreads, tastyworks caters to them all. Robinhood makes it easy to buy and sell but where it shines in simplicity it falls short in research capability. While you can view your portfolio holdings and the prices at which stocks are trading easily, Robinhood doesn’t provide screeners or tools of any significance really to help you scout for new ideas. By contrast, tastyworks is built with the idea of helping you to find new trading opportunities using the Portfolio, Analyze, and Trade tabs. On the web-based dashboard, you can Follow stock market trade ideas from experts. Even experienced traders should find this discovery tool helpful in uncovering new trading ideas. Not sure about a trading strategy? Test out your own ideas using the Analyze tab on the dashboard. Rather than risk your own money, check the gain vs loss risk profile of the trade during the expiration cycle. The visual display will highlight all the relevant calculations, fees, and timelines so you are left in no doubt how your position will change in value at different price and time points. The Correlation Matrix is another diamond under the hood of the tastyworks dashboard. Want to know how much Facebook changed when Alphabet rose or fell? The Correlation Matrix shows you instantly. Pro Tip: For experienced traders who want even more tools, compare tastyworks vs thinkorswim. 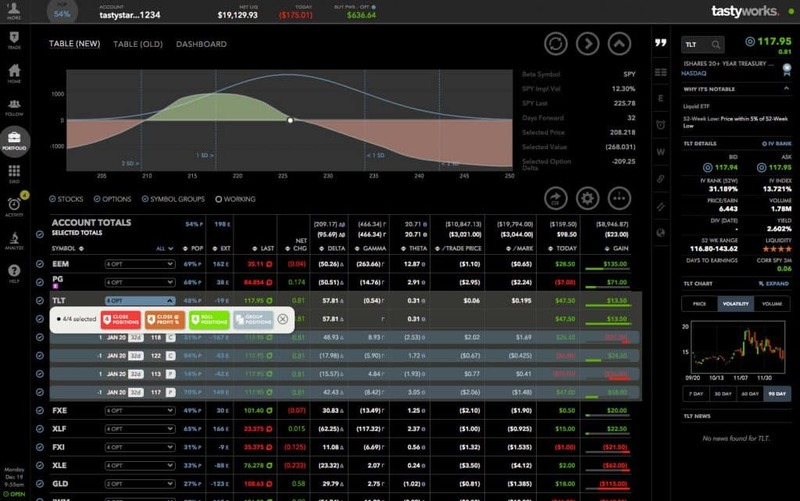 thinkorswim has feature-rich charts that display over 300 technical studies, Fast Beta (an embedded programming language), Strategy Roller to automate covered call roll forwards, and lots of screening and scanning tools. With so much to offer, it is obvious why tastyworks has built such a loyal following. But Robinhood has its merits, especially for cryptocurrency traders and stock traders who care more about price than research capability. ✅ Active Options & Futures Traders: tastyworks caters to all options and futures strategies, whereas Robinhood supports just a few basic ones. If you are an active and serious options or futures trader, tastyworks is your best bet. ✅ Commissions and Fees: You can’t beat zero commissions for stock, options, and cryptocurrency trades. This is where Robinhood scores most points. ✅ Order Types: Robinhood does not support market orders for options trades so if you want fast execution, you will need to stick with tastyworks. ✅ Cryptocurrency Trading: tastyworks does not support crypto trading, so if buying Bitcoin and Ether is of interest to you, Robinhood wins. ✅ Tools and Research: tastyworks has an abundance of tools to help you find new trading ideas, follow expert traders, analyze new trades, and even correlate the movement of stock prices with the prices of other securities. Robinhood by comparison has very few tools. ✅ Intuitive Platform: Robinhood is designed for traders who want to buy stocks easily. As a result, the platform is easy to use and quite intuitive. The tastyworks platform will take more time to learn due to all the features under the hood. ✅ Live Financial News Network: The tastytrade financial news network is available free all day to tastyworks users. Financial experts feature throughout the trading day and discuss strategies, market movements, and hot topics to help you improve your trading skills and stay informed. Robinhood and tastyworks are not so much two peas in a pod as they are apples and oranges. Traders who value price the most will be better suited at Robinhood, which provides free stock, options, and cryptocurrency trading. For active options and futures traders, tastyworks is the better choice because it caters to just about every trading strategy imaginable whereas Robinhood supports just a handful of basic strategies. For users who want a simple, intuitive trading experience where they can enter their information at the Robinhood login area, place a trade on the go and move on, Robinhood is better with a more intuitive user experience. However, tastyworks has screeners, tools, and a social layer under the hood which makes it much more powerful when it comes to research capability and finding new trading ideas. Ultimately the choice boils down to your financial goals. Want a quick, cheap trading experience without the frills, Robinhood is for you. But if you need a powerful trading platform designed by traders for traders then tastyworks will cater to your needs best.